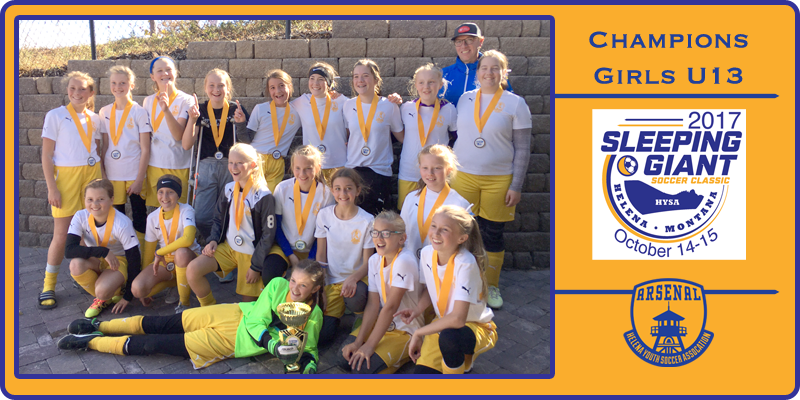 The Helena Arsenal 2005/U13 Girls team coached by Jamul Hahn and Sean Lawlor (in absentia), defeated three different Billings Edge teams en route to their championship finish with a 3-0-1 record. Paving their way to the title game, they tied Billings Edge Crossfire (2-2), and earned victories against Billings Edge SA 406 Elite (1-0) and Billings Edge Crushers (2-0). The Championship was a re-match with Crossfire and Arsenal came out on top 1-0. The team’s goalies Morgan Kaufman and Madison Burda had an exceptional weekend posting three shutouts. The defensive line was rock solid as well, spearheaded by Lauren Hoxie, Sydney Emmons, Brooklyn Brisko, and Ashley Cortez. The midfield shut down a lot of opposing attacks and was led by Tess Lawlor (3 goals/1 assist), Josie Esponda, Molli Soper, Morgan Hayes and Natell Goodman. Passing among the front line was spectacular this weekend showcased by Avery Kraft (1 goal), Astri Hahn (1 goal), Logan Todorovich (1 goal), Madi Todorovich (2 assists), Isabelle Linder, Kaidyn Dolezal and Lina Pescosolido. After a significant number of second place finishes, the team was delighted to be finally bringing home the Championship trophy on our home turf !